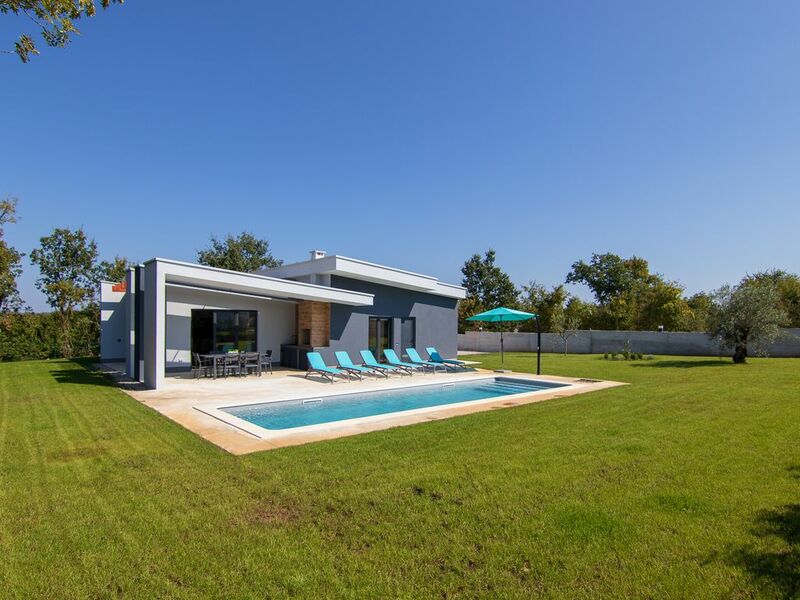 Villa Mariva has three bedrooms with private bathrooms, a pool as well as a 800 square meter garden that gives you privacy to enjoy your vacation. The Villa is set behind a wide gate with three parking spaces. From the parking area, the house can be easily accessed (just one step) for all types of guests. Villa Mariva is fully furnished with A/C and heating throughout the entire house and bedrooms, swimming pool, barbecue, Satellite TV, free fast Wi-Fi and all the comforts you need to feel like at your home away from home. The kitchen is fully equipped with refrigerator/freezer, four-ring electric stove, dishwasher, pots and pans, plates and silverware, Espresso coffee maker, American coffee maker, Espresso coffee maker,Moka coffee maker, toaster, blender and microwave. The kitchen is also linked to the dining area, which is furnished with a large table sitting 8 people. Salt, pepper and basic condiments are provided. Comfortable dinning area is combined with modern full equipped kitchen and with relaxing sofa in leaving room with spacious balcony doors leading to outside patio, pool and BBQ. if guests would need high chair please let us know before arrival. Uns hat es sehr gut gefallen in dieser "neu" Bau Villa. Es ist alles vorhanden, was man für den Alltag benötigt. Die kommunikation mit dem Vermieter ist unkompliziert und man bekommt schnell eine Rückantwort. Bei Ankunft wird man persönlich empfangen. Die Lage war uns persönlich etwas zu Ländlich.